Plan on Karting Abu Dhabi while in the UAE? Not many places nestled in this much automotive awesomeness – this is looking out at the kart track at Yas Marina. On the left is the F1 circuit, on the right is the drag strip at Yas, where you can rent various cars to drag. In front is the amazing superstructure of Ferrari World. My buddy Josh and I were here at Yas Marina Kartzone about this time last year, just a few weeks earlier. There was some kind of motorcycle track day or event going on. A cool shot from later in the evening of the tight turns before the longest straight in F1. You can see the kart track in the background here, which is pretty big. Races are 110 AED for 15 minutes. I bought a package of 4 for 295 AED. They go on your account as credits and are valid up to a year, nicey nice. I used 2 this evening. It was near closing time; people were coming in and out, and I ended up running with people on my first session but my last one was the last of the day and all by myself. Josh and I had 56 second laps last year – even on my first run out I easily beat it though. Did I get that much better? No, I know that’s not the case 🙂 plus the overall top times seem shifted down as well. I’m thinking the course conditions and some other variables have changed over the past year to cause the times to trickle down. First session lap was already in the top of the month (early March) and in my second session I was able to capture the spot from PETR. We’ll see how these stand when I go back to tackle the track during the day. I think a daytime video will come out a little bit better in regards to lighting. Here’s the evening video, as compared to last year, it’s now gimbal stabilized! 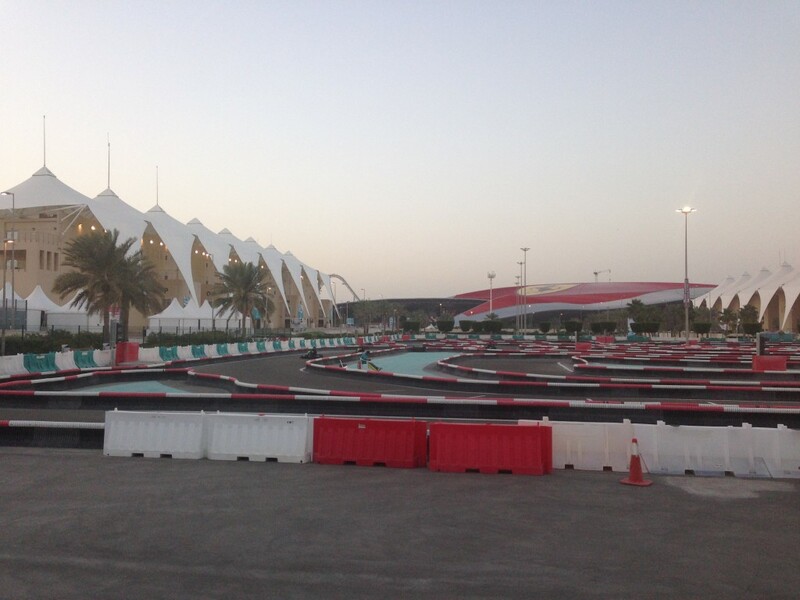 Check my other articles for other places to do spend karting Abu Dhabi, karting Dubai, and karting UAE in general. I’ve visited them all!